more about interpolation you can read it here: SVP | Wikipedia | CV-Foundation | sssh! i've finalize my aviscript setting for double-frame, fixing weird subtitle due different mux time, also make my own x264 encoder setting to make it look smoother. but atm i wont share it yet. how is it look? do you interested watch you favourite anime on 60fps? Asking technical question about encoding time: how much increase in encoding time? (17 August 2016, 12:59 PM)Lynx Wrote: Asking technical question about encoding time: how much increase in encoding time? there is something weird with the animation in 60fps, maybe because it is still "experimental phase"? with weird i mean some lines in the animation moves faster than others, make it not as smooth as i expected. (18 August 2016, 05:50 AM)Lynx Wrote: there is something weird with the animation in 60fps, maybe because it is still "experimental phase"? if i could have a word, it is better to keep the quality as close as the original without adding sugar and salt (not even vinegar) but trying to sequeeze the size with reasonable processing speed. 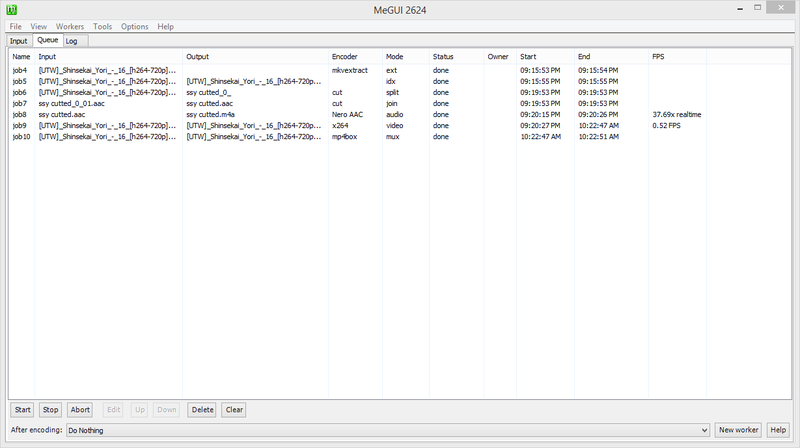 but quality loss is within expectation, and don't forget, MKV need fonts to be embedded, MeGUI didn't have feature for that, we had to use something else.. while it might interesting if it had, embedding something large will certainly breaks the 'smaller size is better' rule. once i forgot to put subtitle on MP4 aviscript, and i decide to mux the subtitle in last step.